I’m so happy with this purchase, I will come right and say it. Quite possibly the best residential motion sensor flood light available is the RAB STL360HW. 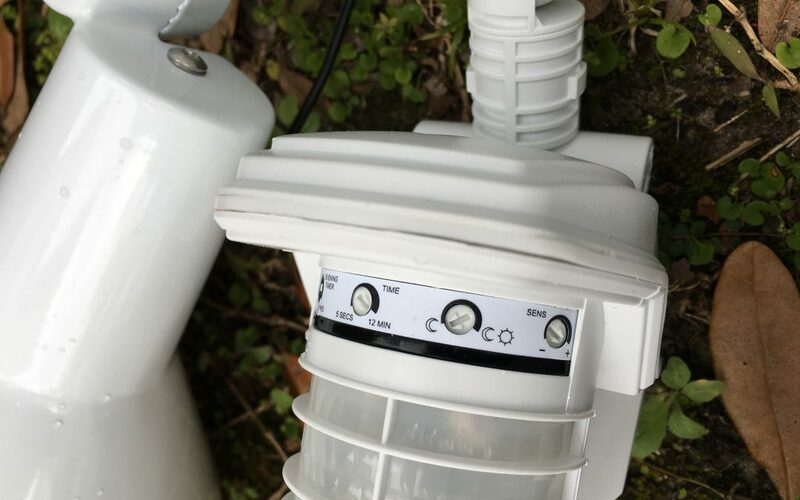 I installed 5 of these lights around my home after making the mistake of buying the LED Lithonia motion lights from Lowe’s. Knowing the Lithonia name, I assumed the fixture was a safe bet and bought one. The Lithonias had plenty of plastic in the product, but worst of all – when the dusk to dawn sensor activated and turned on the lights, it then immediately turned off sensing the light it was itself producing – causing an intense strobing loop. I eventually could adjust the lights farther upwards and rotating the weather shields to stop this effect, but the pathway I was trying to light was not properly lit anymore. This led me to search for a better light. Ultimately I landed on the RAB STL360HW. The RAB lights are 100% metal, which is unlike almost all of the other comparable motion lights on the market. They are extremely well built and come with a set of gaskets to form a proper seal to the wall or electrical box you onto which you are installing the lights. They have a host of settings for sensitivity and the time the lights will stay on, but this is pretty typical for most comparable lights. Where the RAB shines is the quality of its sensors. It has built in safeties to know when it turns its lights on, disengaging its photocell to prevent strobe light effect which I experienced with the Lithonias. It also had a very advanced motion sensor which can ignore small animals like cats and raccoons. Having your motion light turn on all night because of small animals is very annoying, especially for those of us who have lights near bedroom windows. These RAB lights accept any standard PAR38 flood light bulb. I installed LED flood type bulbs. Different areas call for different bulbs, in terms of brightness and beam spread. The 2 types I went with in my installation were: the 14 watt GE-67253-SP which has 1600 candles and a 40 degree spread and the TCP-23E26P3830KFLND which has almost 3,000 candles and 40 degree spread. Both bulbs I chose are LED and rated at 3,000K color temperature. Color temperature is very important when choosing any type of lighting, please check out my color temperature post to learn more. The RAB lights also come with a clear sticker to install on your light switch to operate its special modes. The sticker allows you to control the light’s modes from your switch, which is a unique feature. Lights Stay On – The lights will stay on regardless of motion, time, etc. Evening Timer – The lights will engage at dusk and stay on for the set amount of time you dialed in on the settings knob. Auto Mode – The lights will be in auto mode, which means they will turn on only for motion events during the specified time as set on the settings knob when you installed the lights. If you are looking for a well built, quality motion sensing light for your property, this is it!